The most interesting game was a derby match between two local teams from Panama City: Halcones (#1) and Panteras (#4). Halcones (11-3) won against visiting Panteras (7-7) 79-65. It ended at the same time the two-game winning streak of Panteras. Halcones made 21-of-23 free shots (91.3 percent) during the game. American center Christophe Massie (206-77, college: Memphis) had a double-double by scoring 16 points and 12 rebounds to lead the charge for the winners and the other American import power forward Kwame Alexander (201-90, college: CS San Bernar.) chipped in 14 points and 9 rebounds during the contest. Luis Dinolis (185-93, college: Broward CC) responded with 21 points. Both coaches used bench players which allowed the starters a little rest for the next games. Halcones have a solid three-game winning streak. They maintain first position with 11-3 record. Panteras at the other side keep the fourth place with seven games lost. Halcones are looking forward to face league's second-placed Correcaminos in Colon in the next round and it will be for sure the game of the week. Panteras will play on the road against Caballos in Aguadulce and it may be a tough game between close rivals. The game in Panama City was also worth to mention about. 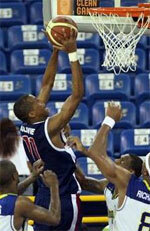 Second ranked Correcaminos (10-4) played at the court of 5th ranked Aguilas (5-9). Correcaminos managed to secure a 6-point victory 80-74. The former international point guard Trevor Gaskins (188-89, college: Louisiana Tech, agency: Pro Sports) notched 17 points, 5 rebounds and 5 assists to lead the effort and Bartel Lopez supported him with 15 points and 10 rebounds. Even 22 points, 7 rebounds and 6 assists by American swingman Lovell Cook (201-90, college: New Orleans) did not help to save the game for Aguilas. Defending champion maintains second position with 10-4 record behind leader Universitarios. Aguilas lost third consecutive game. They keep the fifth place with nine games lost. Correcaminos will play against league's leader Halcones in Panama City in the next round and it will be for sure the game of the week. Aguilas will play on the road against Toros (#6) in David and it may be a tough game between close rivals. Third ranked Caballos (8-6) crushed at home 6th ranked Toros (1-13) by 16 points 81-65, which is the biggest margin this round on Saturday night. The best player for the winners was CJ Rodriguez who scored 20 points, 7 rebounds and 6 assists. Caballos' coach David Rosario used an eleven-player rotation and allowed the starting five to rest. Joel Munoz produced 18 points and 9 rebounds for the guests. Caballos maintains third position with 8-6 record having just three points less than leader Universitarios. Toros lost fourth consecutive game. They stay at the bottom place with 13 games lost. Caballos will meet at home Panteras (#4) in the next round. Toros will play against Aguilas and it may be a tough game between close rivals. The game in Panama City was also worth to mention about. 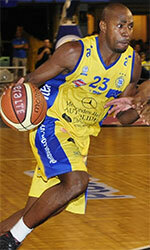 Second ranked Correcaminos (10-4) played at the court of 5th ranked Aguilas (5-9). Correcaminos managed to secure a 6-point victory 80-74. Correcaminos players were unselfish on offense dishing 21 assists. The former international point guard Trevor Gaskins (188-89, college: Louisiana Tech, agency: Pro Sports) notched 17 points, 5 rebounds and 5 assists to lead the effort and Nicaraguan center Bartel Lopez (212-89) supported him with 15 points and 10 rebounds. Five Correcaminos players scored in double figures. Even 22 points, 7 rebounds and 6 assists by American swingman Lovell Cook (201-90, college: New Orleans) did not help to save the game for Aguilas. Jonathan King (193-90, college: Abil.Christian) added 19 points and 5 rebounds (on 7-of-8 shooting from the field) for the hosts. Defending champion maintains second position with 10-4 record behind leader Universitarios. Aguilas lost third consecutive game. They keep the fifth place with nine games lost. Correcaminos will play against league's leader Halcones in Panama City in the next round and it will be for sure the game of the week. Aguilas will play on the road against Toros (#6) in David and it may be a tough game between close rivals. The most interesting game was a derby match between two local teams from Panama City: Halcones (#1) and Panteras (#4). Halcones (11-3) won against visiting Panteras (7-7) 79-65. It ended at the same time the two-game winning streak of Panteras. Halcones made 21-of-23 free shots (91.3 percent) during the game. American center Christophe Massie (206-77, college: Memphis) had a double-double by scoring 16 points and 12 rebounds to lead the charge for the winners and the other American import power forward Kwame Alexander (201-90, college: CS San Bernar.) chipped in 14 points and 9 rebounds during the contest. Four Halcones players scored in double figures. Luis Dinolis (185-93, college: Broward CC) responded with 21 points and Puerto Rican forward Benito Santiago (198-89, college: Cumberlands) scored 14 points and 6 rebounds. Both coaches used bench players which allowed the starters a little rest for the next games. Halcones have a solid three-game winning streak. They maintain first position with 11-3 record. Panteras at the other side keep the fourth place with seven games lost. Halcones are looking forward to face league's second-placed Correcaminos in Colon in the next round and it will be for sure the game of the week. Panteras will play on the road against Caballos in Aguadulce and it may be a tough game between close rivals. Third ranked Caballos (8-6) crushed at home 6th ranked Toros (1-13) by 16 points 81-65, which is the biggest margin this round on Saturday night. Caballos looked well-organized offensively handing out 21 assists. The best player for the winners was naturalized American point guard CJ Rodriguez (188-94, college: S.Nazarene) who scored 20 points, 7 rebounds and 6 assists. Naturalized Puerto Rican Nate Butler-Lind (198-89, college: TCU) chipped in 16 points, 7 rebounds and 7 assists. Four Caballos players scored in double figures. Caballos' coach David Rosario used an eleven-player rotation and allowed the starting five to rest. Point guard Joel Munoz (183-80) produced 18 points and 9 rebounds and Venezuelan Graddy Osorio (193-87) added 7 points and 14 rebounds respectively for the guests. Caballos maintains third position with 8-6 record having just three points less than leader Universitarios. Toros lost fourth consecutive game. They stay at the bottom place with 13 games lost. Caballos will meet at home Panteras (#4) in the next round. Toros will play against Aguilas and it may be a tough game between close rivals.